The fx-991es is the same as the fx-570es but solar assisted (internal g13 cell battery) rather than pure internal battery. both models replace the older ms editions (and no connection to the old fx-911m). it's formula entry like all other modern casio, sharp and ti offerings. afaik, only hp are still releasing aos/rpn models like the 17bii+ and the 12cp. this model is aimed squarely at the competitive and cost-sensitive, educational market with user operation, functions and modes organized to mirror the math curriculum. this can be both a benefit and a drawback. its beneficial because, as a student, you can be sure that there's everything here you need, but also a drawback because the function set can be a bit stunted and unnecessarily modal. the main ui attraction is the, so called, natural textbook display. this is the ability of the machine to draw out a calculation formula in a mathematically written way. this is rather nice for a budget calculator and it manages to size-up square root signs, fractions and brackets accordingly to fit around sub-expressions. this is a nice touch and you can turn it off if you prefer into, so called, line mode which might be more useful when you want to fit the most on the screen. there are also a whole swathe of annunciators and the obligatory four-way navigator. physically, the unit is slim and pocket sized. housed in the now standard reversible hard-cover case that stows onto the back of the calculator when in use and to offer desk stability (there are no footpads, only plastic dimples). additionally, the cover hosts the symbols and codes for the built-in unit conversions and physical constants. the front face is rather smartly designed with the silver metal effect plastic and clearly written, colour coded functions. casio have clearly got budget calculator buttons sussed as these buttons feel quite good for the price bracket and certainly acceptable. superficially, the feature set is vast, with the box claiming an outstanding 403 functions. inside, there is a fanfold user manual and appendix manual. other papers are the same in different languages. a quick summary of functions include; regular scientifics, fractions, unit conversions, physical constants, number bases, complex numbers, matrices, statistics, vector math, equation solving, numerical integration and differentiation. that's quite a lot! but as i discovered when i came to try them out, many of the more advanced features are rather limited. I have just discovered a problem with this calculator. there is no keyboard buffering. when entering a long formula, the calculator redraws after each key press, but as the formula becomes longer and slower redraw, it can miss keystrokes. this is especially apparent when entering numbers with repeated digits, like 100 or 4405. these can come out incorrectly as 10 and 405.
try this, 1÷298.257-0.7292115x10-4 ² × 6378.137³ ÷ 2 ÷ 398600.4405. actual answer is 1.6221172263x10-3 but you will find the last number might come out as 39860.405 (don't forget the x² and x³ terms). formula entry works like the others, but i would have liked ans to re-insert the previous expression into the new formula, if only to give the formula display a hard time. its nice to see implied multiply with brackets like 2(1+2) and (1+2)(3+4) and also with expressions, like 2sin(1). also the automatic bracket closure, ie 2sin(1 = will calculate 2sin(1) as expected rather than give an obnoxious syntax error as some previous models did. the recent calculations are remembered in a history trail which can be recalled, edited, and re-evaluated. and there are six variable memories (a-d, x & y) in which to store temporary results as well as the usual, M, independent memory. its nice to see the calculator recognise some special case results, like arc tan(1) as π/4. and also to be able to simplify surds like √8 = 2√(2) and improper fractions. the editing and correction of input is helped by the 4 way navigator, once you get used to it. working with fractions is a bit peculiar at first having been used to pressing the fraction over key. this time you have to press the fraction entry key before entering both the numerator and denominator expressions (except in line mode). there are 40 built-in scientific constants and 40 unit conversions which are called up by numeric codes from 01 to 40. a table of codes written inside the cover lists their meaning. this is quite useful. accuracy is very good due to the built in 15 digit accuracy. see the torture test. the built-in solver allows the entry of free-form expressions involving variables X, Y and A thru' D. the idea is that you solve something like Y=f(x) with f(x) involving any of A-D as constants. the solver will prompt for input values of any of A-D appearing in f(x) then solve for X given Y and an initial guess. its all a rather straightforward application of newton's method with no refinement. nevertheless, it can be very useful. the usual offering of dec, hex, bin and oct. word size is fixed. hex is 32 bit and binary is 16 bit. annoyingly the base operations like and, or, xor, xnor, not and neg are on the base menu rather than the keyboard. especially annoying is neg which really should be available on the (-) key. otherwise pretty boring and more awkward to work with than the old fx-50f. you would expect a full complement of complex number operations not just the simple four basic operations and a few other simple ones. but that's all there is. in complex mode you can perform √-4 to get 2i, but you can't square root a complex number like 1+i. this is a bit lame. you can perform x², 1/x and x³ and use free-form expression involving i, but this isn't any better than the fx-5500L from years ago. nope. i think the complex number support is, at best, poor. I was highly disappointed to find you are limited to only 3 matrix variables and one result variable, called matA, matB, matC and matAns. and if that wasn't bad enough, you can only have matrices up to 3x3, how useless! i'm sure you could almost invert a 3x3 in your head quicker than having to especially go into matrix mode, enter the matrix values using the matrix editor, then perform the matrix operations and read off the result. nevertheless, apart from having to go to the menu each time to recall the variable matA (or whatever) into the expression, you can actually construct a free form expression of matrix arithmetic. you are allowed +, -, ×, scalar multiply, x², x³, 1/x, abs and also the built-in matrix operators det (determinant) and trn (transpose). so, for example; (7matA³+matB).matC^(-1) is valid. expressions involving divide are not allowed and are not interpreted as premultiply by the inverse (ie A/B ≡ inv(B) × A ) which is a useful abbreviation offered by some calculators. the matrix expressions are definitely the way forward. obviously the educational curriculum does not contain more than 3x3 matrices and implementing divide would be wrong teaching despite the obvious convenience (matrices form a ring and not a field so divide does not truely exist). vector calculation is also offered as a separate mode, this doesn't do anything useful except dot and cross products of 1x3 vectors. 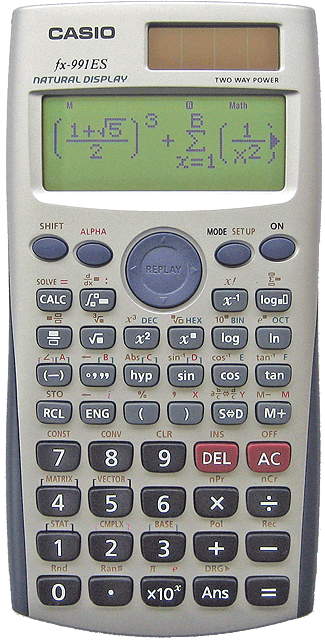 the newer casio models use gauss-kronrod quadrature. this is a developed version of gaussian integration in which the sample points from the previous iteration can be reused in the next increasing until the error estimate is below a given tolerance. for smooth functions it works very well. for others, ones with high oscillation or non-smooth cusps, it can be more work than simpler methods. in the torture test, the fx-991es did quite well, getting 92% for integration. the main surprise being that it was quite slow for a 21st century offering. 4 minutes, 20 seconds is a long time to wait these days for a result. it did however, deliver accurate results once it finally finished. differentiation is numerically performed on the given point, there is no symbolic attempt. the stats mode offers various forms of regression; linear, quadratic, logarithmic, exponential, ab exponential, power regression and inverse regression. this might seem an extensive set of options until you realise that once you have linear (on calculators for decades), all the rest come about by simply transforming the input data according to the required regression type. there's the usual 1d and 2d stats with standard deviation and correlation. there's no X², F or T tests. however, there is normal distribution. i was interested to see P(x), Q(x) and R(x) which conventionally refer to the area under the normal distribution from -∞ to x, from 0 to x and from x to +∞ respectively. of course, they're all basically the same function. the excitement faded a bit when i discovered that these functions only give 5 digit answers and you have to be in stats mode to access them from the stats menu (why not from generic comp mode, i don't know). a few more digits would have been nice. the hp32e quickly gave a full 10 digits back in 1978.
the fx-991es is definitely value for money, but is it good enough? for a knock-about scientific calculator is passes the test, but i keep wanting a bit more than it offers; like more comprehensive complex number support, bigger matrices and a programable memory. of course, more function means more money. these units must be produced at cut-throat cost reduction prices and this is why its limited and a bit slow. nevertheless, if you're buying this to help you pass your exams, then, if this is a $25 calculator, is a $50 calculator that does the rest, totally out of the question. that's up to you. also checkout the sharp DAL el-520w. the formula display is definitely the coolest thing about this unit, in this department, it excels against the calculators of yesteryear. but in other ways, it seems rather poor that calculators of 20 years ago like the hp15c and the hp48g win hands down on depth of functionality against today's digital wizardry. they were, and still are, of course, a lot more expensive.